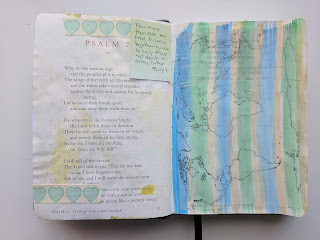 A few weeks ago I got a copy of Psalms from Amazon in the hopes of doing an entry a week and doing each Psalm. The pages in this book are thicker than a normal bible page and that makes it easier to watercolor without always using gesso page prep. Today I did Psalm 2 which felt very appropriate with how divided we all are. I did gesso the right page since I plan to watercolor on the next page so the watercolors wouldn't reactivate and mud up. I used Prima watercolors the blue is from Decadent Pies, Green from Odyssey, and gold from Metallic Accents. I then used clear sticker paper and printed a map outline and attached it after the watercolor dried. I wanted to leave the left side of the page readable. 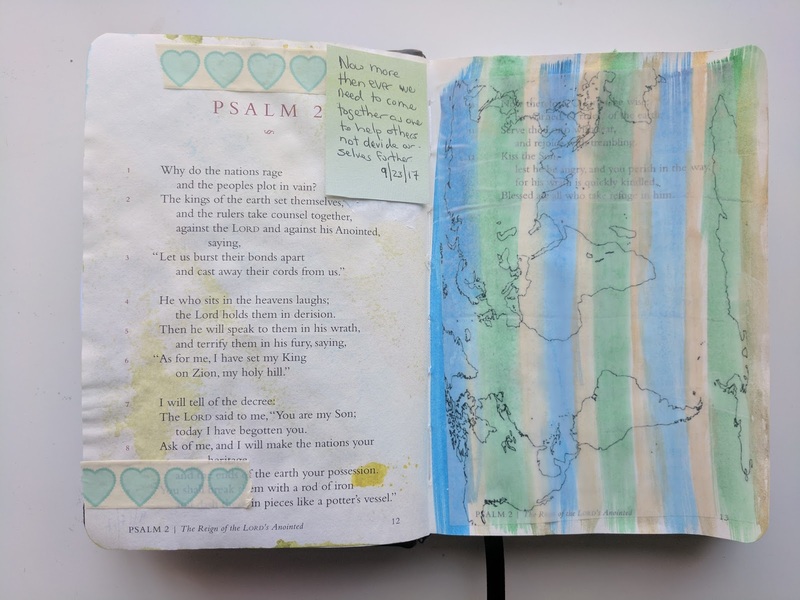 So I started my journaling in the upper right corner and made a few errors that I covered up with white paint and then put a piece of patterned paper on top with my journaling. I finished it off with some old Glitz Designs washi tape that I've had for a few years.